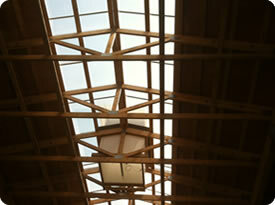 Providing Natural Light Along the Ridge of Your Facility! Twinwall polycarbonate glass endures all weather. Diffused light for maximum benefit without hot spots. Decreases amount of electrical lighting use. 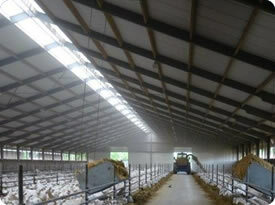 increase in energy savings and livestock production. Our Dura-Lite Fixed Ridge is the perfect product to assist in lowering your energy bill and decrease the amount of electrical lighting use in your facility! You can now replace your noisy & disruptive lighting with soft and natural light. Natural light will make your facility warm and inviting, lifting the comfort level of your livestock and employees resulting in increased production! Dura-Lite Fixed Ridge works great in conjunction with our Max-Vent Insulated Chimney. 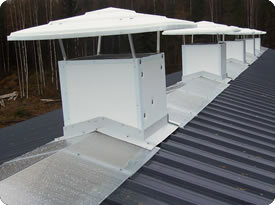 Sun-North Systems Ltd. manufactures and installs the Dura-Lite Fixed Ridge system in a wide range of lengths and widths. Dura-Lite Fixed Ridge can be custom made to retrofit an existing barn ridge system or tailor made to suit a new facility. Made from twinwall polycarbonate glass, Dura-Lite offers 99% light penetration. Due to the construction of the glass, Dura-Lite Fixed Ridge endures all weather conditions offering high thermal resistance, while blocking UV transmission.